A 41-year-old suspected hungry looking cultist, kidnapper and ritualist, Onwuzuruike Nwakaogwu, has confessed to his involvement in a cult group popularly called Dey-Well at Igwuruta village, Ikwerre Local Government area of Rivers State, just as he revealed the identity of the deceased whose skull was found with him as Victoria. 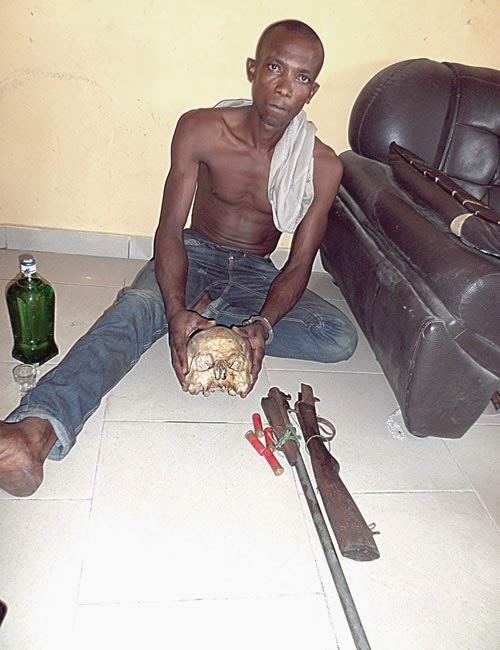 The suspect claimed his efforts at getting money from the skull yielded fruit before his arrest as he said that it used to spew out N10, N20, N50 notes whenever he poured ‘kain kain’ (alcoholic drink) on the skull before reciting incantations. But his efforts at repeating the same act in the presence of Sunday Tribune after alcoholic drink was given him yielded no result as the skull remained as it was without bringing out money. The Commissioner of Police in State, Mr Tunde Ogunsakin, said that SARS operatives, headed by Tunji Disu, a Chief Superintendent of Police, received an intelligence report on the activities of some ritualists at Igwuruta vilage in April, 2014. He disclosed that the Officer-in- Charge raised a team, led by Inspector David Ameh, and assigned it the duty of gathering more information on the activities of the suspected ritualists. The commissioner said the operatives were able to get information about the leader of the suspected group in the person of Nwakaogwu in May but efforts to arrest him proved abortive as he was always on the run. However, the security agents’ moves yielded fruit on Monday, June 23 when a combined team of Metro Intelligence, Metro Storm and Bomb Squad of C4One section went to the suspect’s hideout at Omuwenyi in Igwuruta village and arrested him, Ogunsakin added. He said that items recovered from Nwakaogwu included a local pump action gun, four live cartridges and human skull surrounded by bitter kola and neatly kept in a corner of his one-room apartment. “Upon investigation, it was discovered that the skull was that of a lady who was murdered by the suspect and his gang. The suspect also admitted to using the skull as a medium to get rich, claiming that the skull talked whenever he performed libation on it, and would give him naira notes in N10, N20 and N50 denomination. The suspect also confessed his membership of a brutal cult group ‘Dey-Well’, the police commissioner stated further, saying that investigations were still ongoing. On how he came about the skull, Nwakaogwu said: “I saw it in the bush about two weeks before my arrest. I was in the bush on ‘patrol’ when I came across the skull by luck. I know the lady to whom the skull belonged. Her name was Victoria and she was a tenant in our village. She was from Imo State. I learnt she went to steal cassava in the farm and she was beaten to death, after which she was roasted. The incident occurred over two years ago. “I was not around on that day but learnt about it when I returned to the village. When I stumbled on the skull two weeks ago, I decided to pick since nobody was in need of it. I took it to my room and kept it there. Anytime I had alcoholic drink, I poured it on the skull, waiting for it to bring money that I could use.